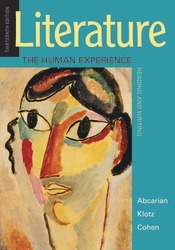 Now in its thirteenth edition, Literature: The Human Experience provides a broad range of compelling fiction, poetry, drama, and nonfiction that explore the intersections and contradictions of human nature. Timeless themes such as innocence and experience, conformity and rebellion, culture and identity, love and hate, and life and death are presented through the context of experiences that are enduringly human. By presenting diverse selections from contemporary and classic authors across time and cultures, students are certain to discover literature in this anthology with which they can connect. Literature: The Human Experience is also designed to make teaching literature convenient for instructors and to make reading and writing about literature appealing for students. A flexible arrangement of literature within each theme allows instructors to teach the text however best suits their classrooms, and the expert instruction and exciting selections will help to guide and entice even the most reluctant readers. Enhancements to the thirteenth edition include four updated casebooks—one per genre—that help students to see how literature can make arguments as well as new reading questions that ask students to make arguments about the selections. To top it off, Literature: The Human Experience costs less than comparable anthologies, providing a wealth of material for an affordable price.